Josef Albers was a German-American painter and art educator. He began his training at the art academy in Berlin in 1913 and finished his studies at Bauhaus in Weimar in 1920, where he later taught glass painting and woodworking. Due to the political situation in Germany, he emigrated to the USA in 1933 and taught Robert Motherwell, William De Kooning and Robert Rauschenberg. Josef Albers turned to geometric abstraction from the 1920s on. He experimented with the impact of colours, forms, lines, and areas and their optical perception.His most famous series ‚Hommage to the square’, whose paintings consist of three or four squares of different colours that are nested into each other, resulted from this. He did not mix the colours in this series, but used industrially produced colours that he applied directly. 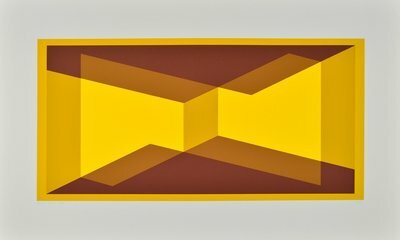 As a result, Albers proved that the exact same colour appears differently to the viewer depending on the surrounding. You want to learn more about the artist? Visit Josef Albers to get more details about the artist's works. You want to buy artworks and editions of Josef Albers, but you have further questions? We collected detailed information for this purpose.